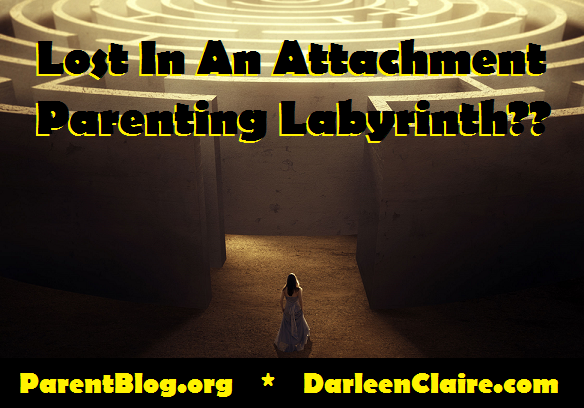 Home » Children » Lost In Attachment Parenting Labyrinth??? Are your children ruining your relationship? Do they talk back? Are they throwing temper tantrums? Are they unable to fall asleep at night? The Huffington Post shared how parents are suffering as a result of an incomplete model of Attachment Parenting. Parents – Stop this insanity! 1) AP is more effective in a family with co-parents who are in a stable relationship. Co-parents must nurture children in a balanced environment that stands on the solid foundation of co-parenting love, passion, and commitment. 2) Attachment Theory describes how children develop relationship skills, social skills, trust, and healthy understanding of boundaries. AP does involve closeness and cuddling, but it also requires parents to set healthy boundaries while teaching solid social skills. 3) Attachment Theory explains how the infant’s brain becomes more specialized and complex with every moment. AP dictates that parents support infants and children to explore self-awareness, self-soothing, and behavior compliance in order to promote development of vital brain centers. 4) Parents teach and model appropriate behavior for children. AP parents must show children solid self-care, effective rules, and especially healthy boundaries. This helps infants and children learn how to become effective and happy individuals. 5) AP is not just a model for early childhood. Healthy attachment formation increases in depth and complexity throughout life. Parents should prepare to maintain nurturing and gentle child rearing while maintaining a developmentally nourishing and stimulating family environment. Attachment Parenting is the time-honored tradition most recently revitalized in the books by Dr. Sear. The popular AP model is unfortunately woefully incomplete. Attachment development is the foundation of Attachment parenting, and is a highly complex process. AP calls for so much more than just loving, cuddling, and co-sleeping. Join along as we journey through the AP labyrinth to help you find your way! 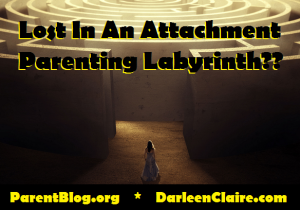 Follow our series of articles that are sure to clear up any confusion about best AP practices … and rescue parents who feel lost in the labyrinth! The wonderful news is that the pathway out of the maze follows along a path of intensely researched and evidence based parenting practices that align with healthy brain development of infants and children. So, please love your children with all of your heart! And learn to set healthy limits while teaching awesome skills to your infant and child … to give the incredible gift of developmental health and solid Attachment Formation. Darleen Claire is a Parenting Expert with a background in Clinical Mental Health Counseling, Exceptional Student Education, and Brain-Based strategies to promote healthy development. She consults with parents who are raising a traditional family, nontraditional family, or who are Attachment Parenting, Home Schooling, or raising children with special needs, such as RAD or DSED.